Caboose 1287 and Business Car #2 (date and location unknown). 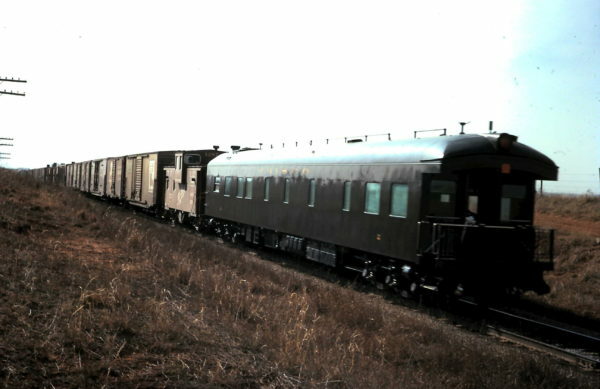 Water, Fuel, Tool and Generator Car 105724 at Carthage, Missouri (date unknown). The elevator in the background was the Norris Grain Company. It is now owned by and is painted for the ConAgra Turkey Company. The 1923 built, 200,000 bushel, concrete elevator is located at 534 North Main Street. Its silos are 80′ 6″ tall, with the head house 119′ tall. It stands north of the Frisco tracks between North Meridian Street (to the East) and North Main Street (to the West). Prior owners of the elevator and mill complex include Carthage City Mills (1888), Cowgill & Hill Milling Company (by 1925) and Cowgill Flour Mills, Inc. (by 1947). The multi-building mill and elevator complex dates from 1888. 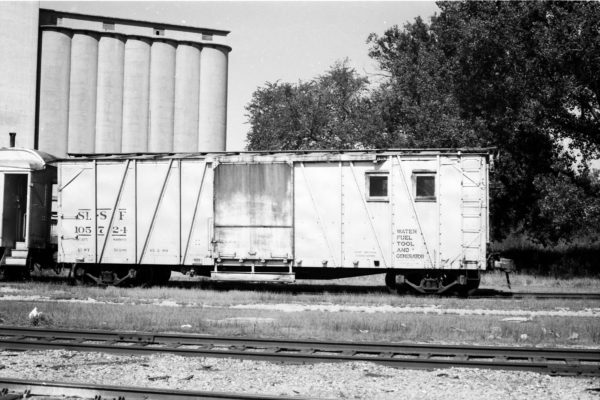 The “new” or “modern” concrete elevator replaced a former 90,000 bushel, 16 bin, iron clad, wood cribbed elevator. The Frisco’s tracks run at an approximate 45 degree angle from the Northwest to the Southeast in this area. Our stone walled depot originally sat between the same streets, but South of the elevator and tracks, just to the left of the photographer. The depot address was 506 North Main Street. South of the depot, across the house track, was the Frisco’s wood frame freight house at 428 North Main St.
Fortunately, the depot was preserved, moved stone by stone, and reassembled in town at a fenced and gated large private residence estate at 1201 East Chestnut Street. The view is looking Northwest from the 400 block of North Meridian Street.